Alphacool has unveiled a new addition to the range of hardware this week with the introduction of the HDX5 Cooled M.2 RAID add-on card which combines both a cooling system and RAID controller. 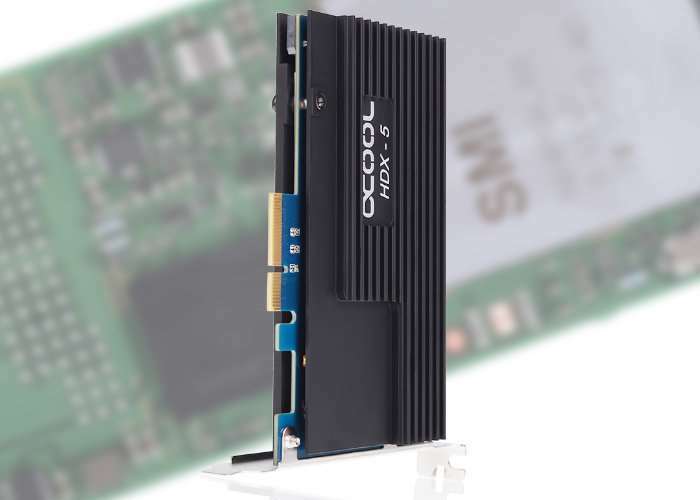 The HDX5 hardware includes two slots for M.2 SATA SSDs and two additional SATA slots, allowing you to set up a RAID 0 or 1 group, while also providing bandwidth of up to 3900 MB/s thanks to the PCI-Express 3.0 x 4 ports. The 4x PCIe plug-in card provides your SSDs with a bandwidth of around 3900 MB/s. This eliminates the usual system bottleneck – the connection between the SSD and the system – entirely. Normal SATA slots on a motherboard provide a maximum data transfer rate of around 640 MB/s, and even most M.2 connections on a motherboard often only provide around 1900 MB/s. One problem with direct connection to the motherboard is cooling. At high or continuous rates of data transfer, M.2 SATA SSDs often overheat and drop their speed. This can lower performance down to 10% of actual capacity. On motherboards, the M.2 slots are often located directly underneath or beside the graphics card, which serves to heat them further. Cooling this area is often only possible to a limited extent due to the lack of space. If you’re looking to take advantage of your M.2 SATA SSD’s maximum performance, a good cooling solution is a must.